If Bed 5 (Flowers, Pollinators, Herbs) was pretty much a reprise of things we’ve grown before, then Bed 6 is almost the exact opposite. It features not only new varieties of common vegetables, but some things that we’ve never tried before. Let’s start with the more common things. In the spring, we will be trying out three varieties of beets. ‘Cylindra’ is a red been that is long and cylindrical rather than round. Some people find this variety sweeter than regular beets. ‘Boldor’ is the newest variety of yellow/gold beets. The other more recent variety, ‘Touchstone Gold’ was an improvement over the heirloom varieties that typically had poor germination. It will be fun to see if this is another good improvement. ‘Avalanche’ is a white beet that is also an All America Selection. It has been a while since there has been a new white beet variety, so it will be interesting to see if it is an improvement. In the fall, we will replace the beets with some slightly less common things. ‘Brilliant’ Celeriac (aka celery root) is grown for the root, not the leaves/stems like traditional celery. It commonly needs a long, cool growing season, so it will be fun to see if we can make it grow here! 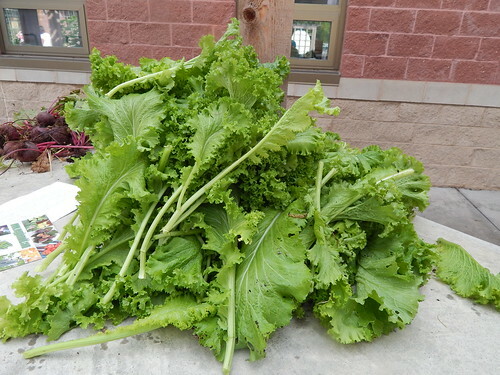 ‘Helenor’ rutabaga is another root vegetable that is common further north. Again, it may not grow well for us here. If you aren’t familiar with the vegetable, rutabagas are kind of like large, sweeter turnips. 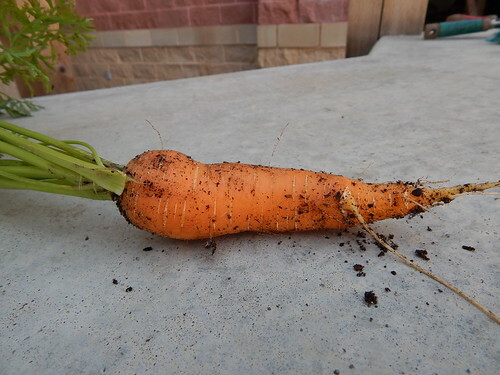 ‘Merida’ carrot is a variety that is supposed to work well for overwintering, so we will give that a try this fall. Then, there is that other strange stuff shown on the map. You are probably wondering if those are vegetables that I just made up. I didn’t! They are real things! Oca is a root vegetable that is native to the Andes. It is somewhat like a potato, but has bright colors. Will it like Kansas? We won’t know until we try it! Black Scorzonera is an old, European root vegetable. Sometimes called “oyster plant” for the flavor, it is considered something of a delicacy, albeit rather difficult to grow and prepare. It needs a long growing season, too. Will it like Kansas? We’ll find out! Crosnes (aka Chinese Artichokes) are from mint family and develop little tubers that look a bit like miniature Michelin men. The tubers don’t develop until the daylength shortens at the end of summer or early fall, and it can be killed by frost. Will they do much in Kansas? If you guessed, we don’t know, that would be right! I’m hoping for some interesting and photogenic vegetables from this garden, although I have to be honest that if the summer turns out to be too hot and nasty, then we could just have lots of dead plants. My best intentions to post more than once a week keep being thwarted by various and sundry other things going on. I guess the most positive way to look at it is that when it stays colder, things don’t grow fast enough to get ahead of me and my sketchy posting schedule. That looks like it is going to change here this weekend. I just wish the rain in the forecast wouldn’t keep getting moved further out with lower percentage chances! Here’s a look at the whole garden. Yes, we have the trellises up! 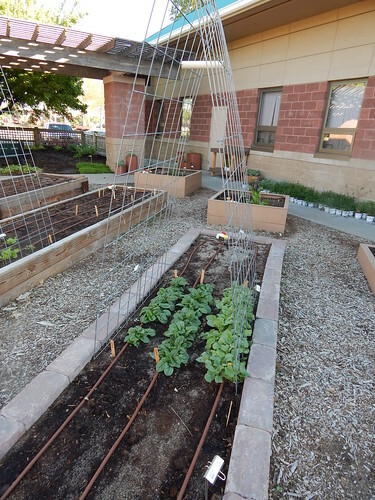 Nothing is planted, but we wanted the trellises up as a display for Herb Day. Speaking of Herb Day, I think I forgot to mention it with my dearth of posts in the past few weeks. 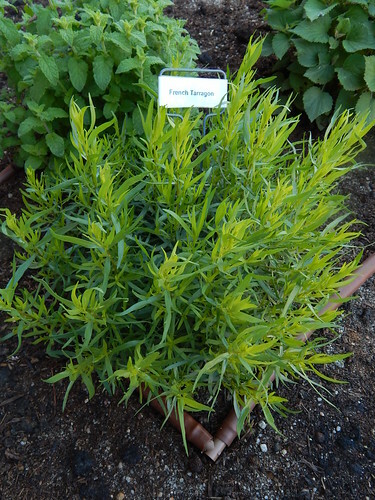 The French Tarragon is looking great in the garden. It must know that it is the featured herb tomorrow! 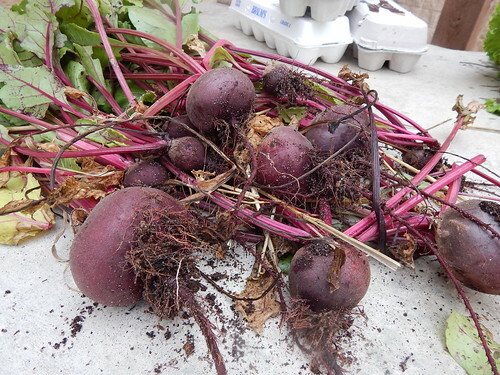 On the other hand, the beets aren’t looking particularly spectacular, but I don’t think it is their fault. It looks as though something is enjoying them as a snack, and I can’t see any sign of the culprit. 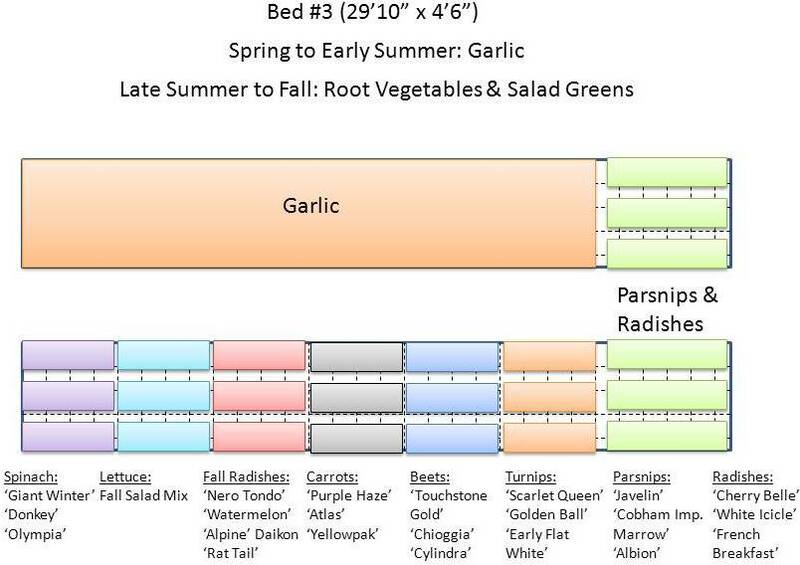 I feel like it almost has to be an insect, since the nearby lettuce and carrots look okay, and the beets are in the middle of the bed. I guess we’ll just have to keep watching! After shivering underground for more than a month, the potatoes finally decided to put in an appearance this last week. I think that only one of the nine seed pieces hasn’t come up, which isn’t too bad considering how cold it has been several times in the last month. Putting the trellises up this week helps the garden literally take shape, and it’s getting me excited to get everything else planted and growing. 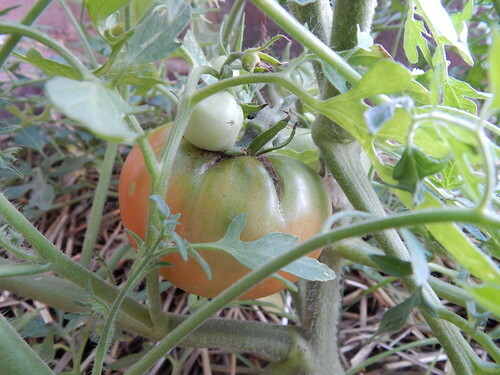 We plant to plant tomatoes and peppers this week, and we’ll probably plant all the vine crops the week after that. Have a great weekend! Don’t forget to come check out Herb Day! This garden is currently planted to garlic with about 5 feet on one end open for something this spring. 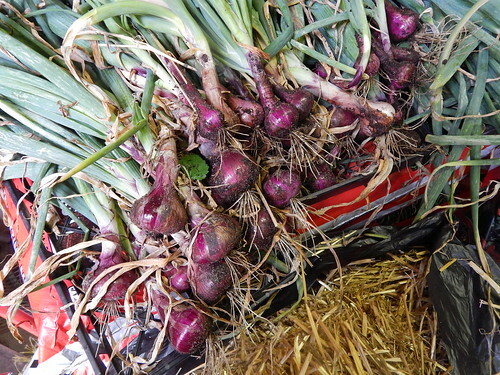 Then the area that is currently garlic will be planted with other greens and root vegetables in the late summer to early fall. 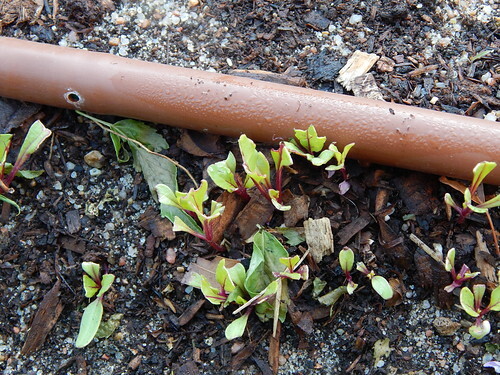 In the open end this spring, we are going to plant parsnips and radishes together. The biggest challenge with parsnips is that they generally take about 3 weeks to germinate. Often they don’t get sufficient water or attention throughout that period to have good germination. They can also get lost in weeds if you aren’t careful. We are going to be co-seeding to try to beat that problem. We will plant the parsnips and then thinly seed radishes in the same row. The radishes should be ready to harvest in about 4 weeks, just as the parsnips are showing up. We’ll see if the technique works! You can see that I have 3 horizontals rows in each section, rather than going perpendicular to the bed. 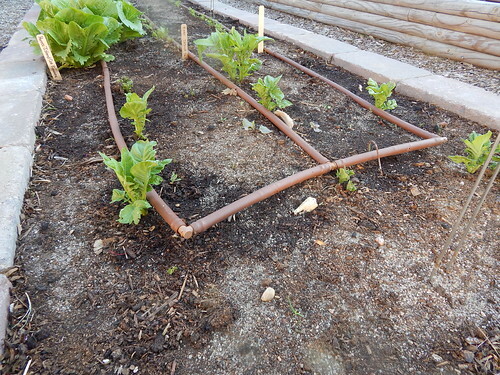 We are going to be planting right along the drip lines, since most of these vegetables have small seeds that need to stay moist. 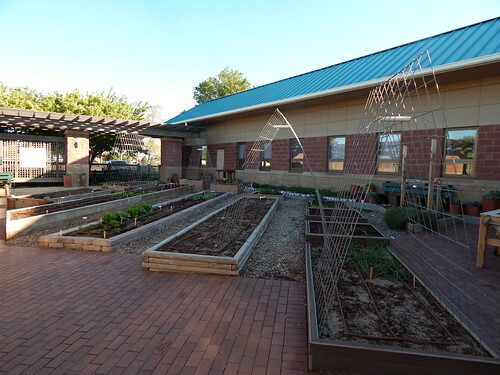 Because of that, we chose during planning to plant 3 varieties of each thing…one variety next to each drip line. There are some fun varieties in this garden…Black, pink, and white fall radishes. Purple, round orange, and yellow carrots. Gold, pink & white striped, and cylinder-shaped beets. Red, yellow, and white turnips. Three parsnip varieties, each of which claims to be “the sweetest” variety. It will be colorful this fall, even if only the worms appreciate it!